It's accessed by holding the home button (plus an upwards swipe), swiping to leftmost pane or just by saying "OK, Google". We found out that the Nexus 5 fires up Google Now on the first G of the command, so you can just say "OK, G" or "OK, Go" and that will be enough. For all it's worth, "OK, Jesus" and "OK, Grandpa" worked too. Google Now gives you short overview of information it believes is relevant to you right now in the form of cards. Going to work in the morning? Google Now knows this and lets you know there's a big traffic jam on your usual way to the office, so it offers you a re-route. Google has added lots of more customization on Google Now in Android 4.4 KitKat. You can now set your default transportation method, you favorite sports teams, company stocks you are following, places you are interested to visit and more. Once you add items you want to keep an eye on Google Now will do this instead of you. It will automatically inform you for various changes, news and updates. Hardware-wise the LG-made Nexus 5 is pretty much the same as the company's G2 flagship aside from the slightly smaller screen. The Nexus 5 runs on the same top of the line Snapdragon 800 chipset with a 2.27GHz quad-core Krait 400 processor, Adreno 330 graphics and 2GB of RAM. Android 4.4 KitKat brings Project Svelte UI optimizations, the successor of Project Butter. Svelte allows even smoother performance and in the meantime lowers the Android hardware requirements down to 512MB RAM, which would open the doors to the latest Android build to budget devices! You'd expect the Nexus 5 to perform the same as the rest of the Snapdragon 800 gang, but as far as synthetic benchmarks are concerned you'd be wrong. Unlike Samsung, LG or HTC, Google had no interest in boosting benchmarking scores and performance and so the stock Android 4.4 KitKat offers no optimizations in this direction. As the charts below will show you, the Nexus 5 benchmark results are much lower than the other Snapdragon 800 devices - the reason is probably sitting some way between the lack of cheating and the fact that the benchmarking apps aren't properly optimized for KitKat just yet. As usual our first test is all about single-core performance. The Nexus 5 scores are quite similar to the Krait 300 CPU on the Snapdragon 600 platform, rather than those of its Snapdragon siblings. The Linpack results are even worse. The Nexus 5 bounced back on the Geekbench 3 cross-platform benchmark, but it didn't quite manage to match the best. Moving on to compound benchmarks, AnTuTu and Quadrant. In AnTuTu Nexus 5 scored similar results to the previous generation Snapdragon 600 devices, while the Quadrant score was downright poor. Now let's look at the GPU benchmarks. We ran GLBenchmark 2.5 and 2.7 in 1080p off-screen mode, which is also the native screen resolution for the current crop of Android flagships. The Nexus 5 matched the Snapdragon 800 competition on this test. The Adreno 330 on the Nexus 5 did pretty well on the Epic Citadel, too. Its score is very close to Galaxy Note 3 and Xperia Z1. The last benchmark we did was the BrowserMark 2, which tests the overall browsing performance. 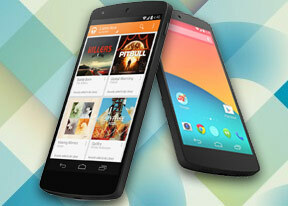 Google's Nexus 5 turned out to be among the best devices we've tested so far. The stock Android 4.4 KitKat with its Project Svelte ran perfectly smooth on the Nexus 5. Even though the flagship scores lower than the competition on the benchmarks, the Nexus 5 is still among the smoothest and lag-free Android smartphone we've seen to date. Everything is blazing fast, scrolling and app launch is really fast and fluid, the overall UI speed has been bumped too. It took Google a while to achieve what Apple has done with the iOS, but it is finally here - the lag-free, fast and buttery smooth Android OS is becoming the norm now.